Disclaimer: This website is for general information only and it contains general advice only, prepared in good faith based on our understanding of relevant laws. No one should rely on the detailed contents in this website without first obtaining advice from a suitably qualified person. 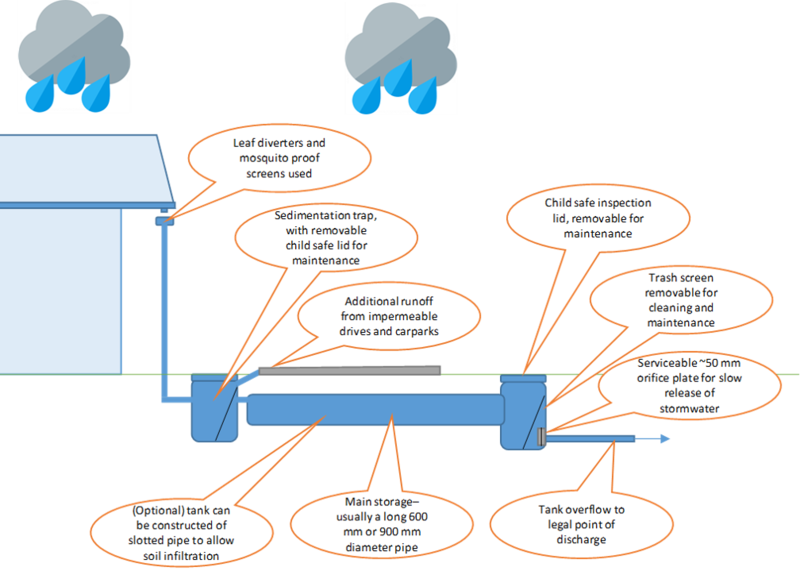 The purpose of rainwater tanks is to capture and use rainwater to conserve potable mains supplies, and reduce stormwater runoff volumes and pollutants reaching downstream waterways. Rainwater tanks are suitable on all developments, however they are most effective on developments that incorporate large roof areas (to maximise capture), and have high water supply demand such as high-density residential dwellings or apartments, or developments with large gardens areas that require irrigation. ensure hot water is uniformly heated to 60° to “sterilise” it for contact use. install backflow prevention valve(s) as per NCC requirements. Additional treatment is generally required when rainwater is to be used as a drinking water supply. To ensure clean water supply in your rainwater re-use system, it is recommended that gutters are fitted with appropriate leaf guards, rainheads are fitted to downpipes, first flush diverters are fitted prior to the tank storage and mosquito screens fitted at the end of all pipes. Rainwater tanks can include stormwater detention capabilities. These systems are referred to as combination retention/detention systems. The detention storage component is typically located at the top of the tank, with a restricted outlet orifice provided at a calculated height above the base of the tank to control peak flows. The detention component remains empty except during a rain event. The retention component is the permanent volume of stormwater stored at the bottom of the tank (below the restricted outlet orifice) that is available for use. Further information regarding detention systems is below. Infiltration systems consist of a shallow excavated trench, soakage well or tank, designed to retain a certain volume of stormwater runoff. The stored water permeates into surrounding soils, significantly reducing runoff volumes, having provided a pathway for treated runoff to recharge local groundwater aquifers and, in turn, surface water resources. Infiltration systems function best when high-infiltration soil types are present (sand or mildly reactive clays). Many suburbs within the metropolitan Adelaide area are characterised by reactive clays not suited to these systems. An estimation of a sites soil type can be determined by referring to the Department of Environment and Water Nature Maps at https://data.environment.sa.gov.au/NatureMaps/Pages/default.aspx and the Soil Association Map of the Adelaide Region, Adelaide Geological Survey of South Australia 1972. Alternatively, for more accurate results, a geotechnical engineer can be engaged to undertake site soil classification and percolation testing. Guidance for the use of infiltration trenches and infiltration wells is outlined in WSUD: Basic procedures for “source control” of stormwater – a handbook for Australian practice. 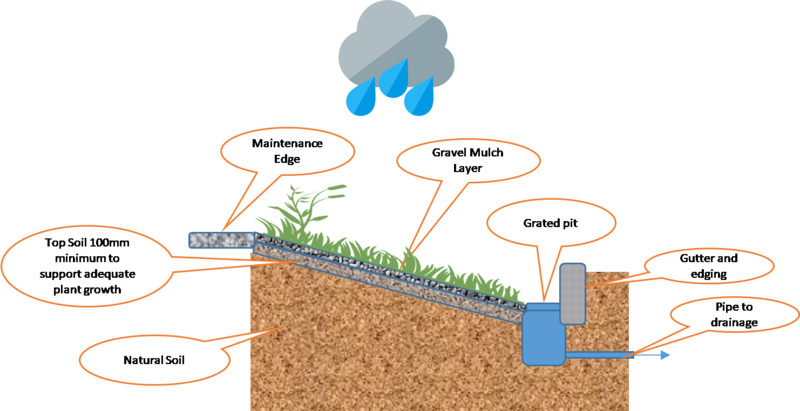 The use of on-site gravel trenches or soakage well infiltration systems in proximity to buildings and other structures is restricted to soil types classified as class A (Stable, non-reactive), Class S (Slightly reactive clay), class M (Moderately reactive clay) or class M-D (Deep moderately reactive clay). The groundwater table is permanently below 1.5 m from the natural ground surface or the final ground surface, whichever is the lowest. Pre-treatment of water for removal of debris and sediment is essential. Pre-treatment measures include leaf filters for roof runoff, and sediment sumps, vegetated swales, bioretention systems or sand filters for surface runoff. The use of on-site infiltration devices is not usually recommended on sites classified as reactive soils of type H / H-D, H1 / H1-D, H2 / H2-D, E / E-D and P as defined in AS 2870, unless under advice from a structural engineer. For a description of these soil types see the Glossary. 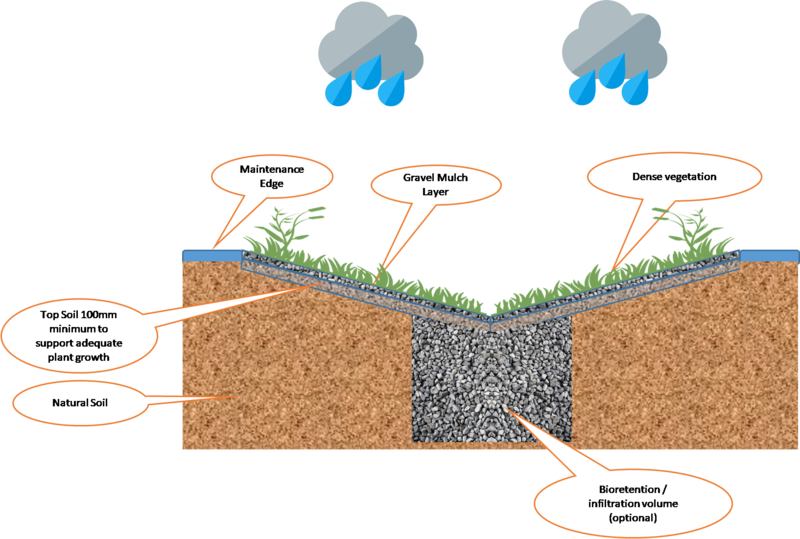 Permeable pavement systems are pavement systems that allow stormwater to percolate through to a sub-surface course, from where it either infiltrates to the soil or is filtered back to the drainage system to subsurface soils or storages to reduce stormwater runoff. Underlying pavement layers can also include perforated pipes that allow the release of stormwater runoff into the receiving drainage system. 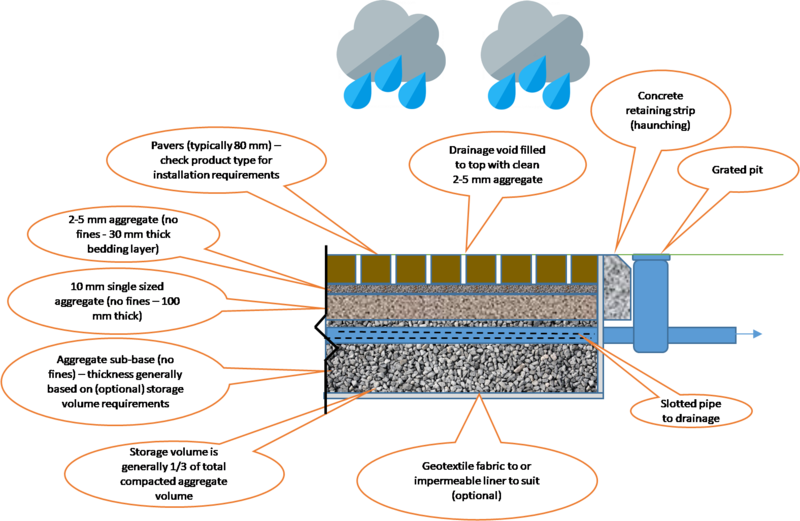 Permeable pavement systems provide two main advantages over regular impervious pavements: Improved water quality through filtering, interception and providing biological treatment; and reduced stormwater flow through infiltration and storage. Permeable pavement systems commonly include interlocking block paving, porous concrete or plastic grids that provide structural stability to gravel or grassed paths, driveways and car parks. Single-sized gravel can also be used as an effective method of reducing stormwater runoff in low-traffic footpath and driveway areas. Porous surfaces: Comprising a layer of highly porous material (e.g. specially designed concrete or asphalt). Permeable pavements: Comprising a layer of interlocking paving blocks (either made with porous material or specially shaped to allow the ingress of water by way of vertical slots) to allow runoff through to the underlying surface. Raingardens improve stormwater water quality by slowly filtering water through the soil layer to the drainage pipe at the base. Stormwater flows are diverted and pollutants removed through the processes of settlement (sedimentation) binding with components in the filter media, and by the action of specially selected plants and the associated microbial community. Bioretention basins are shallow planted depressions that assist in redistributing excess rain and stormwater runoff from the roof of a development, as well as pervious and impervious surfaces. 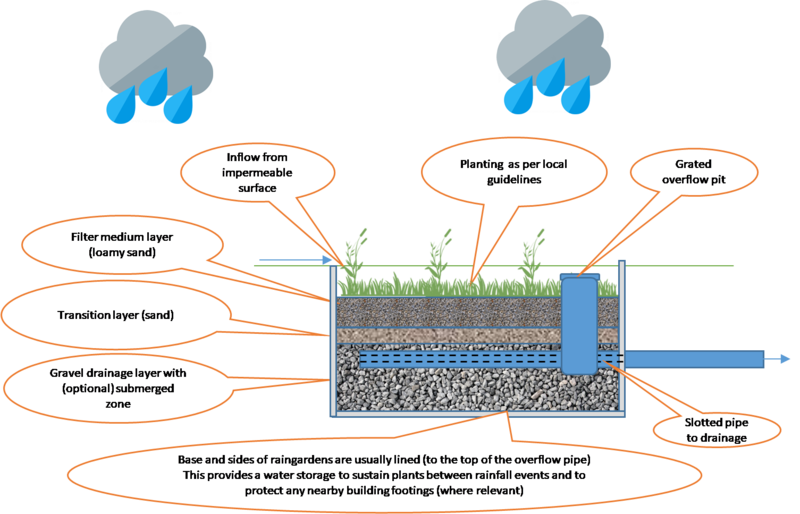 The process assists the rainwater and stormwater runoff to infiltrate the underlying soil, recharge the groundwater and reduce peak flows from the development. Bioretention swales and bioretention buffer strips serve an identical purpose as bioretention basins in that they reduce the volumetric flow of stormwater and improve stormwater quality. Bioretention swales usually include gravel storage volume. The void spaces in gravel helps store runoff from impervious areas (i.e. a carpark or driveway). For South Australian conditions, a rule of thumb guide is for the area of your raingarden to be between 0.5‑2.0% of the area of the contributing catchment (e.g. area of roof or other impervious surfaces draining to the raingarden). For more information and tools for sizing and designing a raingarden see www.watersensitivesa.insitewater.com. Grass buffers are vegetated strips that convey hard runoff from an impermeable surface to a downstream drainage system. Buffers are effective in removing coarse and medium sized sediment from stormwater. Grass swales are formed, vegetated channels that are used to convey runoff from impervious areas. They are typically shallow, linear, and wide. Grass swales can become features in the landscape, require minimal maintenance once established, and are hardy enough to withstand large flows. Grass swales differ from bioretention swales in that they normally have no underlying gravel and drainage layers. Green roofs and living walls can provide reduced energy costs, natural insulation, establish peaceful areas for individuals and a place for wildlife, as well as, absorb and treat stormwater. Additionally, green roofs improve air quality and aid in reducing the urban heat island effect; a condition in which cities and suburban developments absorb and trap heat. Green roofs and living walls consist of a series of substrate layers to support drainage on top of built structures, provide thermal insulation, and can ameliorate the urban heat island effect. 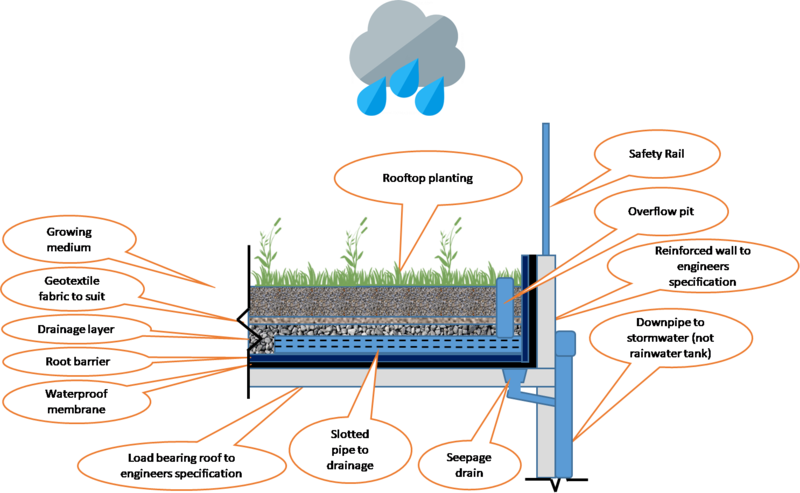 The layers incorporated within green roofs and living walls must accommodate drainage and protect the built structure from moisture and water ingress. This is achieved through the inclusion of a waterproof membrane in the design. High-quality root repellent systems are also required for green roofs and living walls to further protect the surrounding structures. The most appropriate green roof for the Greater Adelaide region is a deeper substrate, which consists of depths between 150 and 600 millimetres of growing medium. Care should be taken that a structural engineer certifies that the building design can support a green roof, and that the design is resistant to heatwaves, as green roofs can “cook” in high temperatures, killing the vegetation. Design responses to improve performance in high temperatures can include deeper growing medium; water storage crystals; effective irrigation; partial shading with vegetation or structures, e.g. solar panels; and the use of annual native grasses and other summer heat resistant species. Detention systems are similar to retention systems, however the captured stormwater runoff is only temporarily “detained” for a short period of time, with stormwater discharged at a controlled (reduced) outflow rate. This helps to limit impacts on the capacity of the receiving drainage system. Stormwater detention systems remain empty at all times, except during or immediately after a rain event occurs. Detention tanks are useful in areas where current stormwater infrastructure has aged – particularly where urban areas have densified over time, increasing impermeable areas connected to existing drainage systems. The installation of a detention tank aims to reduce local drainage overcapacity in existing infrastructure. The effect is usually only locally beneficial, with overall catchment flood volumes remaining the same. The flow rate from the tank may be regulated by the size of the tank and orifice outlet. Onsite detention tanks must be designed to suit the requirements of the proposed building development and its location in the catchment. For more information see local Council and stormwater authority guidelines and AS/NZS 3500.3 (Stormwater Drainage). Developments must incorporate water efficient appliances and fixtures such as showerheads, dishwashers, washing machines, basins, kitchen taps and toilets. The Australian Water Efficiency Labelling and Standards (WELS) scheme is an Australian Federal system established to rate appliances based on their water efficiency. It works by assigning a relevant WELS rating (WELS Star rating) label to certain products. Projects should aim to meet best practice water efficiency standards wherever possible. The below recommended WELS ratings performance criteria has been specified in comparison with the industry benchmark. 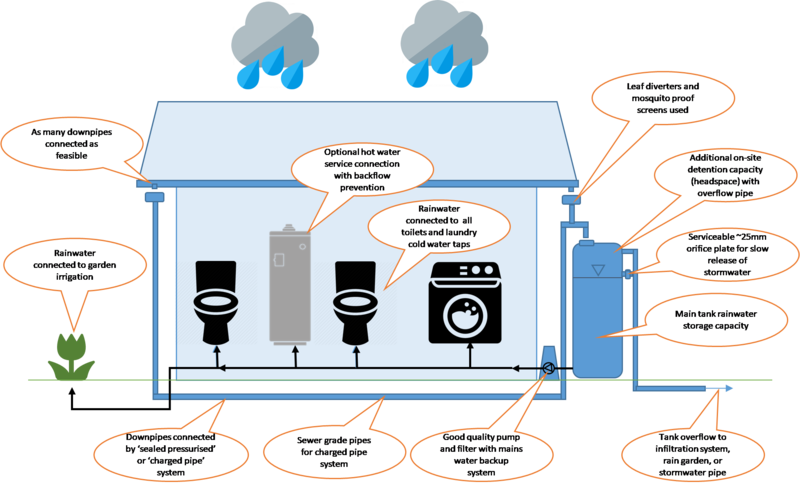 The 25% potable (mains) water reduction performance target compared to a building that has no water saving features can generally be met by using a combination of efficient water fittings and a rainwater tank to supply water for appropriate household uses. This section provides recommended fitting specifications in accordance with the Australian Water Efficiency Labelling and Standards (WELS) for water efficiency of fittings. 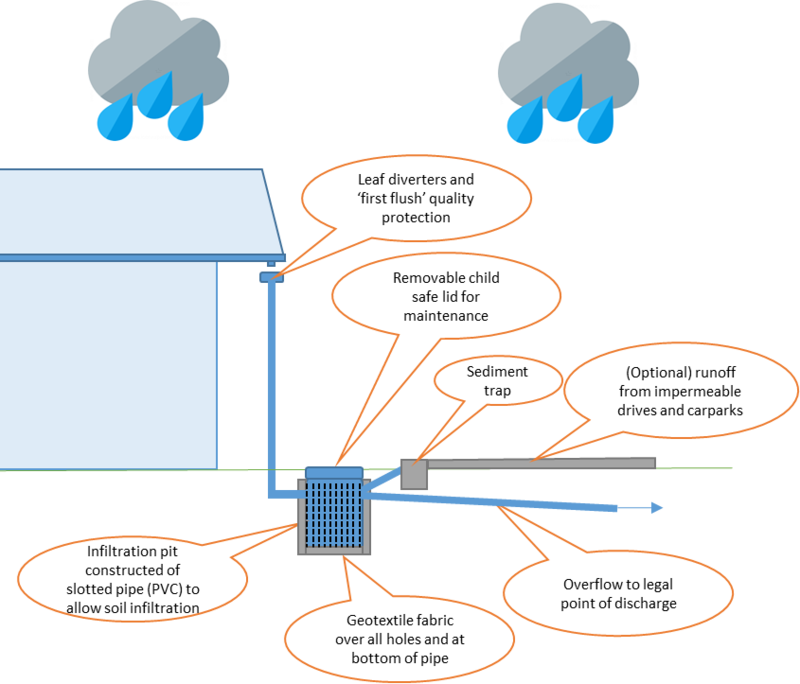 See Water Sensitive SA Fact Sheet WSUD 02 for recommended rainwater tank sizes to meet both water saving and stormwater objectives. Argue JR (2004/2013) WSUD: Basic procedures for “source control” of stormwater – a handbook for Australian practice. Urban Water Resources Centre, University of South Australia. Water, Melbourne. WSUD Engineering Procedures: Stormwater: Stormwater (Kindle Locations 6606-6609). CSIRO PUBLISHING. Kindle Edition.